Ever wonder how the Senior Class funds gifts to the high school, or pays for prom? Or why you have to vote for class officers at the end of every school year? Student Senate, more commonly known as Student Government, is the group constantly working behind the scenes to make things like senior class trips, gifts and proms possible. The Class of 2019 last year sold CHS apparel such as, sweatpants, socks, and sweatshirts to help raise money for this coming spring’s celebrations. The apparel sale was helpful for people who usually don’t play sports, but still wanted to represent their school. Student Government members got the word out by having a table at the Winter Carnival, with samples of the clothing. Then, after February break, the group provided order forms at tables staffed during lunches. Another way of raising money is through an event. 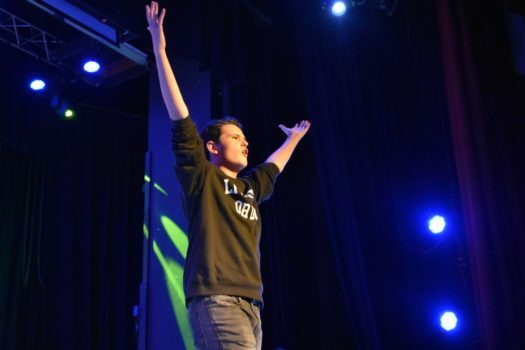 Recently, the senior class held the 11th annual CHS Idol show, charging $5 at the door. Another example is a volleyball tournament in which teams pay to play. One class raised money a few years ago by selling CHS blankets, which were a huge hit. Students took orders at school during lunches and sold them at various school events, such as football games where students who hadn’t dressed warmly needed something cozy. Money is not the only thing Student Government attends to. “Mostly we’ve been focusing on fundraising, but we are trying to expand to more of a government to speak on behalf of the students,” said current Senior Class President Rebecca Bamidele. The vice president assists the president with meetings and with assigning roles in subcommittees. The treasurer keeps track of the classes money: how much they have, how much they need, etc. The officers for the Class of 2019 are, along with Bamidele, vice president Aditya Pant, secretary Kayleigh Doherty and treasurer Eli Boesch-Dining. Junior class officers are president Victoria Yang, vice president Matthew Burns, secretary Buchholz, and treasurer Tristan Sharich. Sophomore officers are Charlie Makee, president, Pauly Buckles, vice president, Emma Hall, secretary, and Nick Richards, as treasurer. Freshman class president is Emma Torija. Students can get involved in Student Government at any time. The club is always accepting new members. “Come to a meeting any time and you’re enrolled!” said Bamidele. Meetings differ for each class, she added. “Seniors meet Wednesday and juniors meet Friday. We also have full senate meetings once a month.” Full senate meetings are when all of the classes and their members come together to meet. Student Government meetings take place in the Main Office Conference Room.